The possibility to import payments from TBS system for the imported services that don’t have other cashing documents added was developed in the latest version of TINA. These payments will arrive in the Imported documents section and will be associated to the specific imported services and corporation. Thus, TINA users will benefit of a new automated process and will be able to enjoy a 'clear picture' in both TINA and TBS systems. 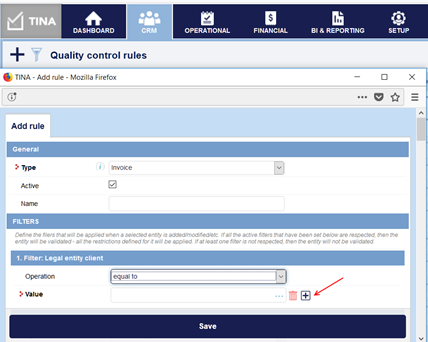 New possibility has been added when defining a Quality Control Rule. This allows the user to apply it for more than one corporation at a time. This translates into more efficiency, through a simplified process of defining QC rules, as well as relevant time savings for TINA users. Until recently, all the configurations were performed by out technical department. In the latest version of TINA we have included the possibility to configure the GoGlobal credentials directly from the interface, by accessing the Setup Module-> Config-> Configuration Assistance section. Now, the users can make these configurations whenever they are needed - this translated into more autonomy, brought by this this new 'self-service' option. The utility of having the possibility to configure the mentioned details is given especially for the cases when the password or any of the credentials are modified. Without this new option, in previous version of AIDA, if Extra descriptions were needed, they were added manually for each package. Now, with this new functionality, Extra description for packages can be added Bulk. The necessary packages are selected, the option to choose from which package the Extra description should be copied is available. The details added in each Extra description field can be edited and deleted, as per the user need. Previously in AIDA, a supplier user (if had access to Manage prices) was able to change the supplier price for all available price sets (rates: Bed&Breakfast, Halfboard, All Inclusive, etc). If one of those price sets represents a negotiated rate, which the supplier user shouldn’t be able to edit, until now the supplier user was able to change the prices. With this new version, each price set has an Allow/Not allow a supplier user to change prices option, set by default on No. When price sets are added, only the TourOperator user allows to the supplier user to change the prices. A new optional field is available for Offer Showcase plug-in which allows to define an URL. The reseller user will be redirected to the specified external URL when clicking on the offer, instead of being redirected to a search section inside TBS.